Chinese New Year gives us a chance to put the spotlight on an animal theme. Last year was a little more cuddly with Year of the Dog, and we may skip next year’s Year of the Rat, but this week, let’s celebrate the beginning of the Year of the Pig. People born in one of these years are said to be genial and accommodating, and “pig” celebrities include Julie Andrews, Magic Johnson, and the not-at-all-accommodating King Henry VIII. This 1977 painting Pig and Piglets is a fairly un-romantic study. For all of Hulings’ work that splashes out with bold color and joy, for all of the unexpected bright accents jumping out from surprising places, he was ultimately a realist. He wasn’t afraid of humble subjects. He didn’t shy away from palettes featuring the browns and neutrals of earth and farms. 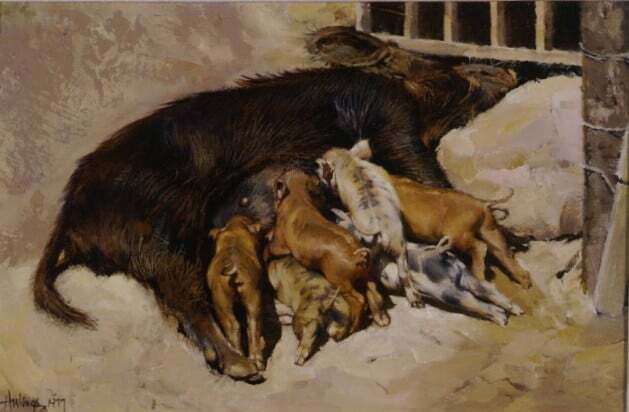 This mother pig might be catching up on rest; we can’t see her face, but we imagine she must be exhausted with her six hungry piglets having lunch…again. With her head tucked between a gate and a rock, she may have found the only quiet place on the farm. We see Hulings exploring a range of textures: the adult pig has interesting details in the fur, with a few subtle red, turquoise and yellow shades showing changes of direction in the hair pattern. Three of the piglets have a rust color with lots of shine; the other three have spots. One of the little guys has stretched out himself completely flat with his legs extended to get in through his brothers and sisters. Pigs come up in art history in Genre Painting—a 17th-18th-century European tradition that re-introduced day-to-day subject matter into fine art. The Dutch, especially Vermeer, were the famous “Golden Age” painters of the style. English painters George Morland and his brother-in-law James Ward each had a few famous pigs, as did American William Sidney Mount. They’re a rare subject for Hulings, who usually preferred to feature a donkey in his genre-inspired work, with the occasional dog, cat, or chickens that might be passing by. For a slice of agricultural life you can take home, we offer Portuguese Farmyard as a giclée in two sizes; it’s whimsical and colorful and filled with animals. Visit us the Clark Hulings store here.